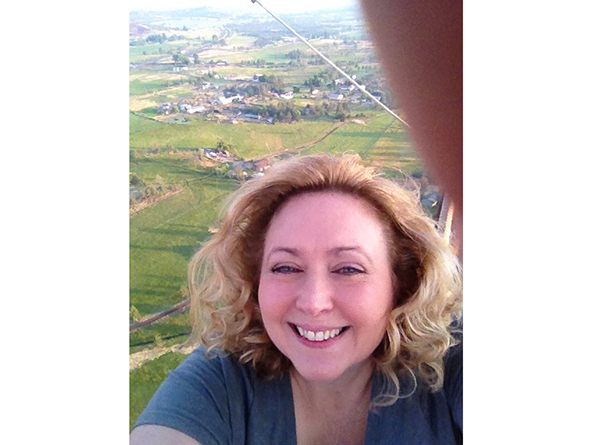 Above: Sen. Carol Blood takes a ride in a hot air balloon near Sisters, Oregon, in 2014. Visitors to the Capitol watching Sen. Carol Blood address a full legislative chamber would never guess that public speaking used to make her uncomfortable. In high school, she decided to do something about it. Blood joined the debate team, got the lead role in a school play and eventually took a job as an actor in a summer theater troupe that traveled the central U.S. giving performances in parks. Blood grew up on a farm outside Hastings and moved to Bellevue in 1992 with her husband Joe, a radio personality. In 2008, after watching Bellevue City Council meetings on cable, Blood decided to step outside her comfort zone again by running for a seat on the council. As someone who ran her own business and marketing consultancy, Blood said, it was frustrating to see that the state’s third largest city had no strategic plan. Blood won the election and spent eight years as the council’s only at-large member. She helped secure funding for a new police station, update city ordinances and fix other problems with simple policy changes. “Policy makes me giddy,” she said. Blood decided to run for a seat in the Legislature because she felt that her experience at the municipal level would be useful at the state level. She understands how state law affects cities and has already built relationships with local officials as well as police and fire chiefs whose advice she knows she can trust. “When I have a bill that I look at and I question whether it’s going to be right for my district, there are people I can pick up the phone and ask,” Blood said. Like most senators, Blood rarely has a free minute, but she still makes time for what is most important to her: her family and her community. She spends as much time as possible with her three children and eight grandchildren and serves as volunteer chairperson of the Bellevue farmer’s market. Blood said that a few months in office have strengthened her belief in how important it is for her to represent the views in her district, not necessarily her own. To ensure her constituents’ views inform her legislation, Blood answers all of her own emails and she and her staff have called more than 2,000 constituents since January, asking for feedback. And she drafted all but two of the dozen or so bills she introduced, which she turned in on the first day of session.